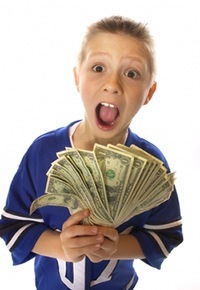 You are here: Home / Family Living / Teaching Kids About Money! How do you teach your kids about responsible spending? It’s not always easy – it’s not a “one size fits all” type of discussion or training. I always loved when my kids received gift cards at Christmas and birthdays because I was able to guide them some in spending them. Then there is son #1. He didn’t work until after college. He however almost ALWAYS had money. He never bought ANYTHING! He saved it all, he also saved everything he could find from domino’s to rocks to stacks and stacks of cups left at the ball games he attended (those went with him when he moved out!). When he started working he was, and is very careful with his money. He buys what he wants, but is careful to ALWAYS have money. He is also very generous as is his sister. This brings me to why I am rambling about my kids spending habits! Mom Central and American Express have asked me to tell you about this great way of teaching your kids about smart spending. American Express has a card for teens called PASS and it is re-loadable and can be customized by your kids to look they way they want it to, and it can be linked to a checking or savings account if you/they would like it to be. No monthly fees until 10/11! This is great time of year to begin teaching our kids about spending. So, check out American Express and their PASS card when you’re ready to teach your kids!